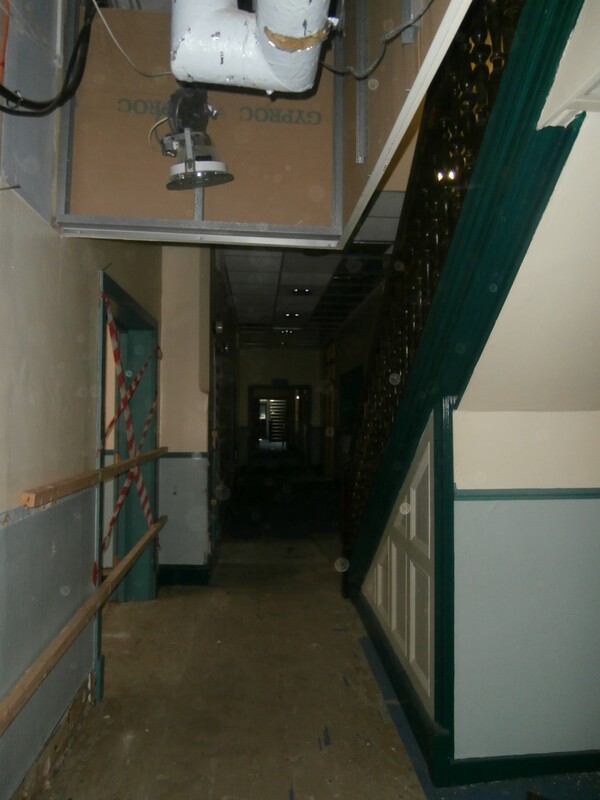 Although the intention is to maintain as many of the old building’s original interior structural features as possible, in order to ensure optimum circulation and movement around the new site, the modernisation process means that some familiar and much-loved features will be lost. 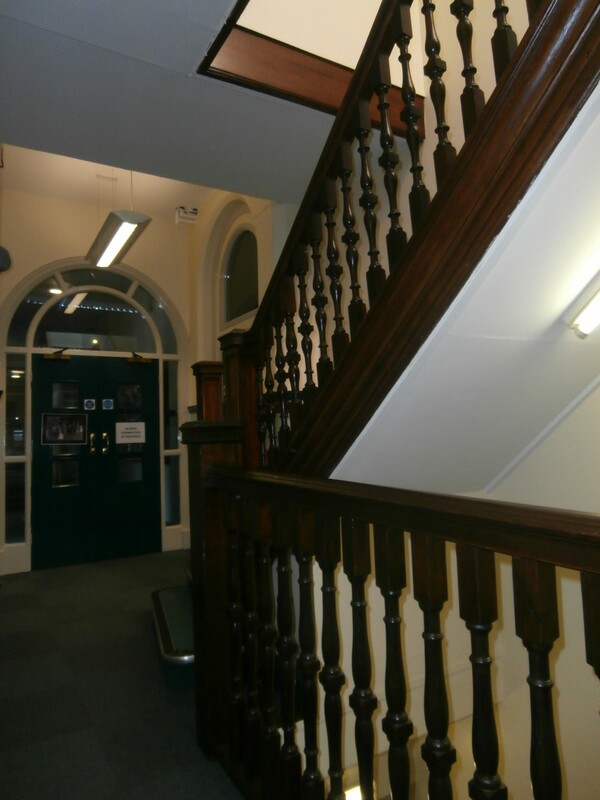 One of these, very sadly from a personal point of view, is the beautiful wooden staircase situated at the north end of school starting just outside the door of the Headmistress’ Office. 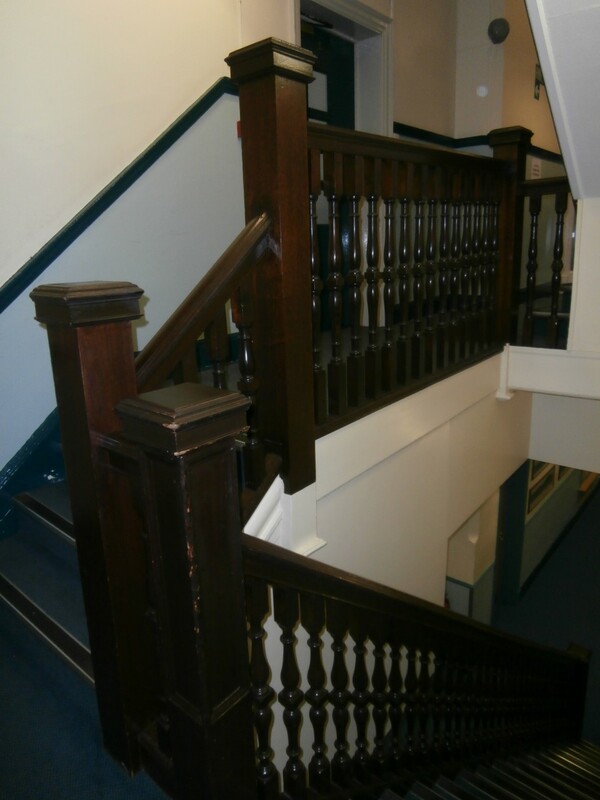 Its highly-polished, hand-turned, dark-wood bannisters and spindles, smoothed by the touch of thousands of hands over the years, always spoke to me of a building with a living past and a strong sense of continuity and tradition. Indeed, I met my best friend and long-serving colleague half-way up those very stairs. During my visits to photograph the demolition of the Junior School, I got talking to one of Tolent’s workforce who had already fallen in love with the beauty of our building. As we watched the wrecking machines levelling the 1970s building and speculated on the new state-of-the-art building it was making way for, Mark commented that the ‘real jewel’ was actually the old building standing behind us. Having explained my connection with the building , Mark asked me to wait as he thought he might have something that would interest me. He disappeared into the main building and returned moments later with something in his hand. 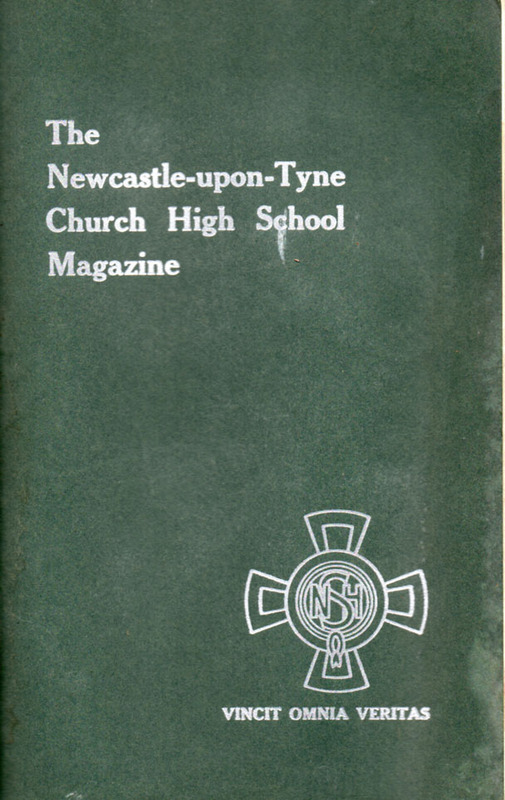 Despite its musty, dusty condition, I immediately recognised it, by its familiar dark green cover, as an old edition of the Church High School Magazine. How appropriate! He then took me inside to see where it had been found and it transpired that as holes were being punched into walls during investigations into the condition of the old building’s infrastructure, within the boxed-in base of the main staircase a small stash of 1930s magazines had been discovered. Clearly this must have once been used as a storage area and the few remaining contents over-looked. When I opened the front cover in search of the exact date however, my smile of genuine thanks deepened into a very wry smile. The magazine was dated 1934-35 and recorded the events of the School’s Jubilee year. The opening words of the Editorial were ‘Annus Mirabilis’ and reading on it was hard to resist coming to the conclusion that, by throwing up this particular copy of the magazine now, the building was not unaware of what was happening to it. The Editorial went on to speak of ‘a second beginning’: ‘There had been that paragraph in the local Press at our inception – “Negotiations are in progress to commence a High School for Girls in Newcastle …… Whether there is an absolute need of such a school …… is another matter”. 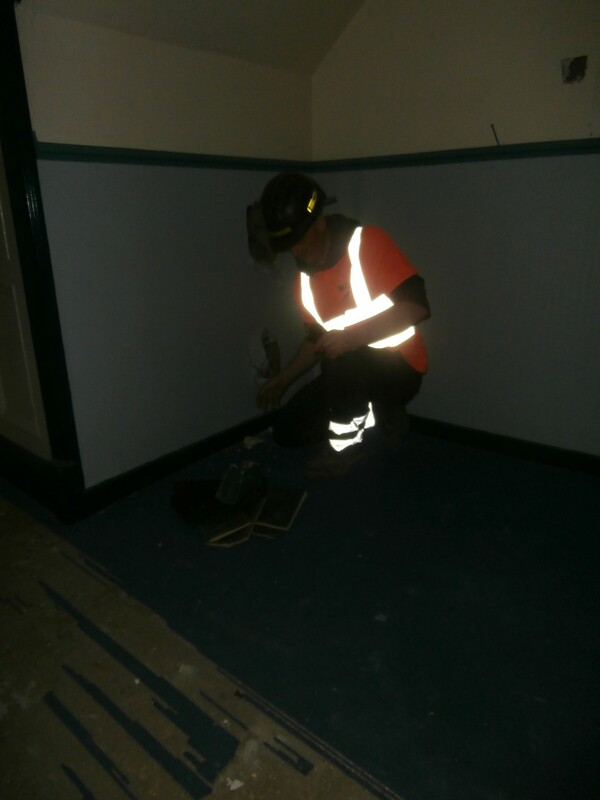 At the same time as the demolition of the Junior School buildings, Tolent Construction and various other contractors were also working to prepare the Church High main building for renovation. 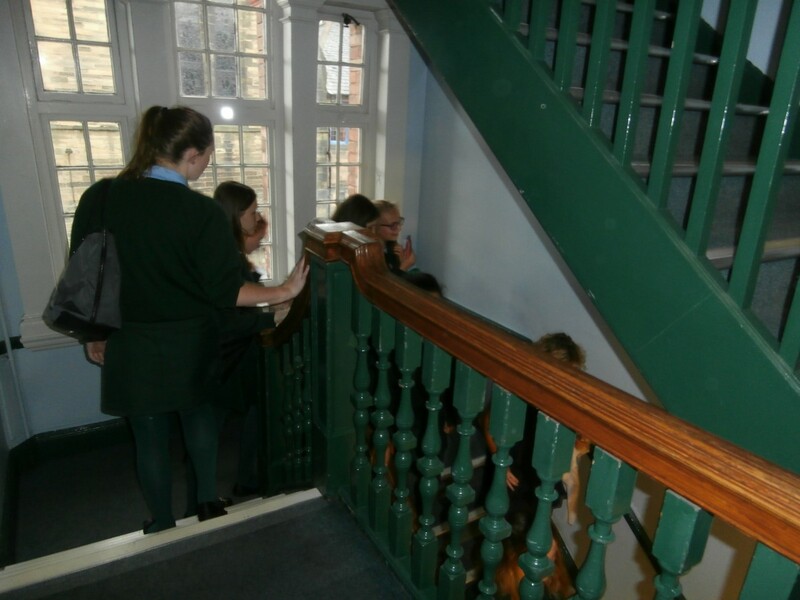 This included sound-proofing tests and testing for asbestos. Very little work is planned for the exterior of the building, maintaining the beautiful Victorian façade being crucial to the redevelopment of the site, but part of the enabling works sadly involved preparation for the dismantling of the iconic ivy cross. 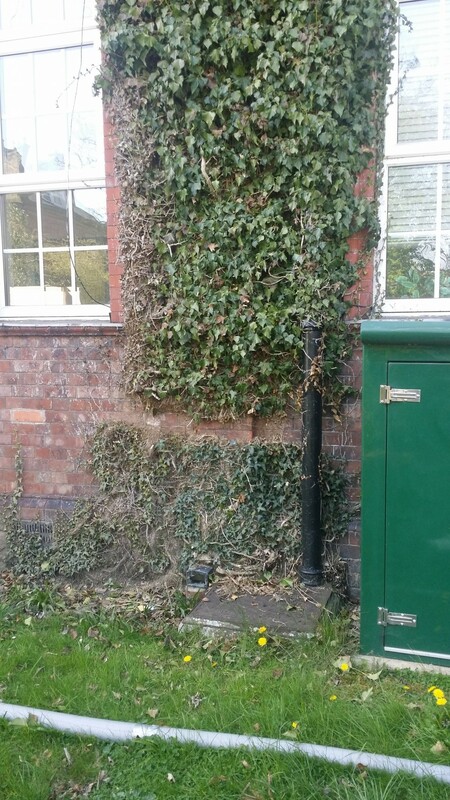 Evidence of Tolent’s ‘Enabling’ work to dismantle the Church High building’s iconic ivy cross. 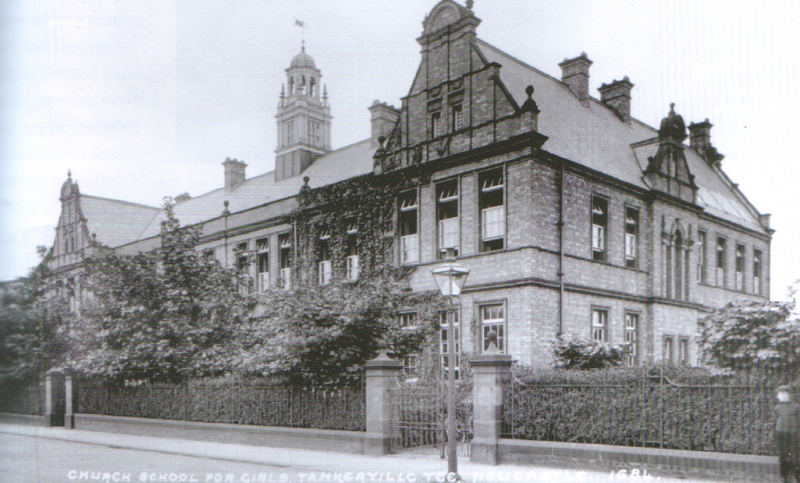 Early descriptions of Newcastle High School refer to its “red brick and deep red brick mouldings” being lined with creepers presenting “a pleasing and picturesque appearance”, so the ivy has clearly been an integral and characteristic feature of the Tankerville building over the years, as this 1910 photograph shows. In 2010 to mark Church High’s 125th Birthday, the School’s Site Manager, Gentian Qeku, who lovingly maintained the gardens in front of the building, trained the ivy into the shape of a large cross representing the design of the Church High badge. 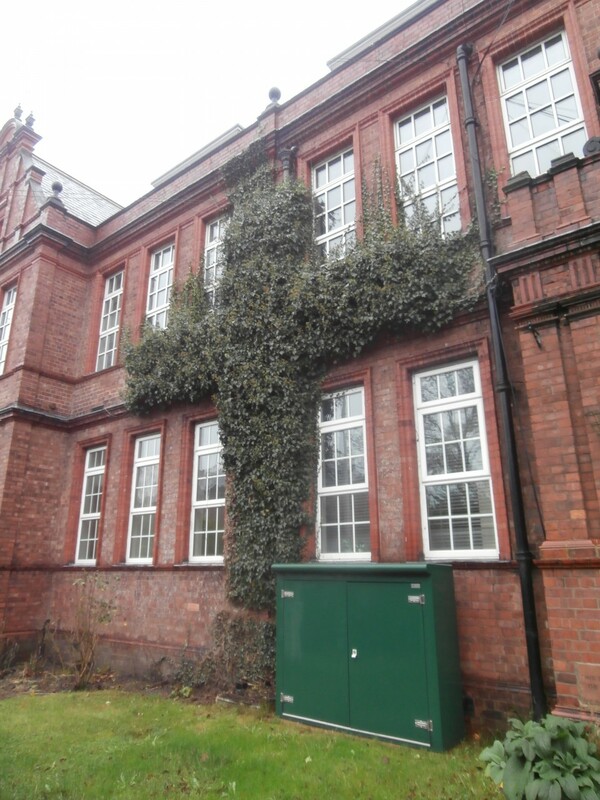 It is hard to think of the school frontage without it now, so strongly has the green cross become synonymous with Church High. Although its removal is understandable because of the new school to be based on the site, many of us will still be very sad to see it go. 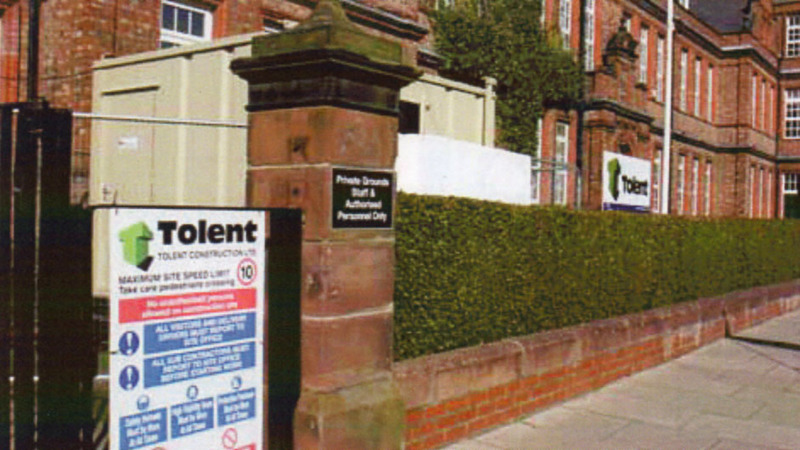 Tolent Construction were awarded the enabling works contract for the multi-million pound redevelopment of the three acre Church High site on Tankerville Terrace. They arrived on site to start the work on March 9th 2015. 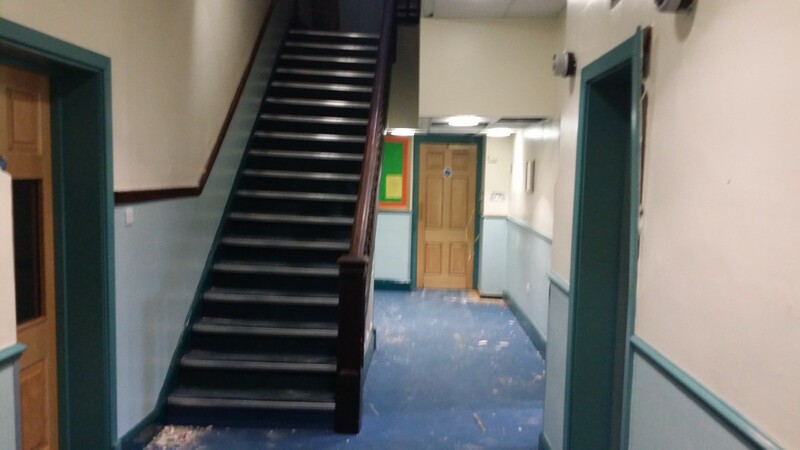 Initial work included the addition of new drainage, tree preservation and preparation for the demolition of the former Junior School buildings to make way for the new, stand-alone three-storey building to be constructed within the Junior School grounds. Tree preservation fencing in place throughout the site. 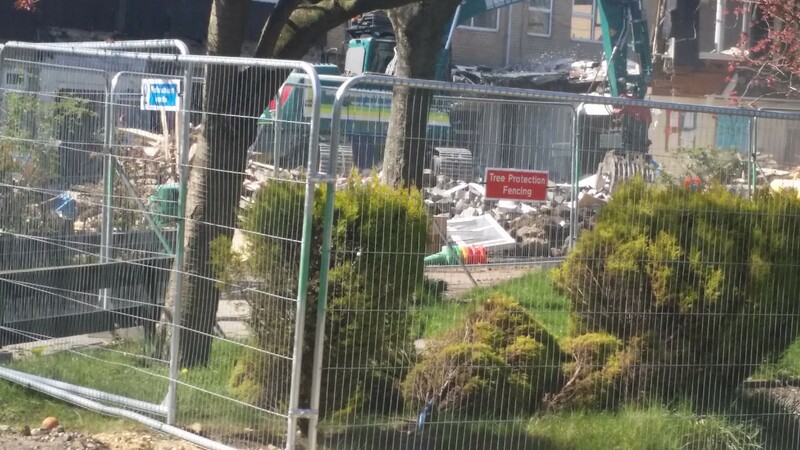 The actual demolition of the Junior School finally got underway on Monday 20th April 2015 beginning with the left-hand wing of the Junior building which housed the small Hall. 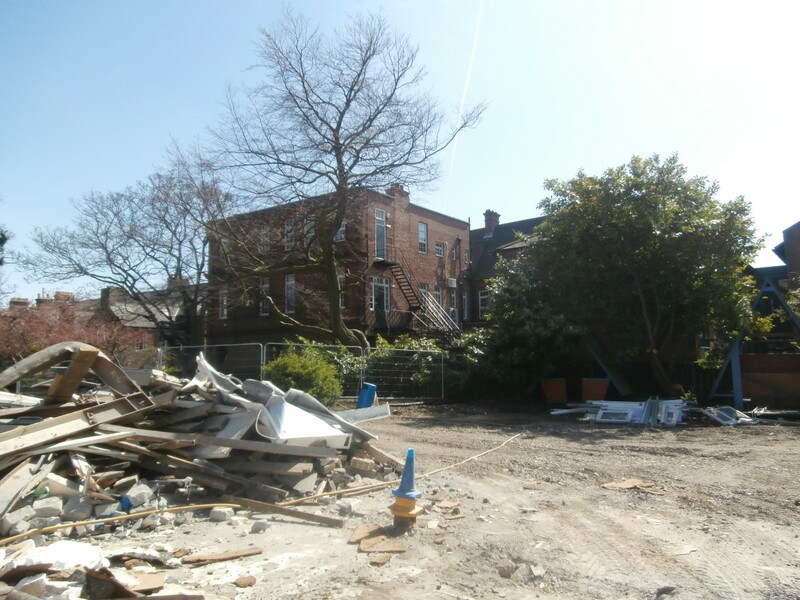 This was completed on Tuesday 21st April; rather amazingly, this stage of the demolition process was actually captured by the Google Maps cameras which were obviously in the process of updating their images of the area. 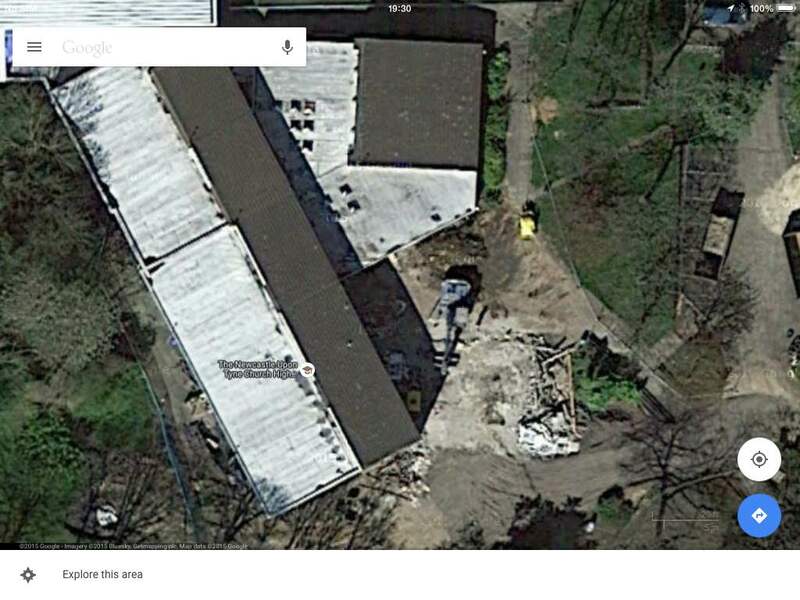 Google Maps images captured on 1st November 2015 clearly showing the first stage of the Junior School demolition being completed on the Church High site. By Wednesday 22nd when I went to take my own photographs of the work in progress, the demolition of the right-hand wing of the building, which housed the main Junior Hall, was already underway. 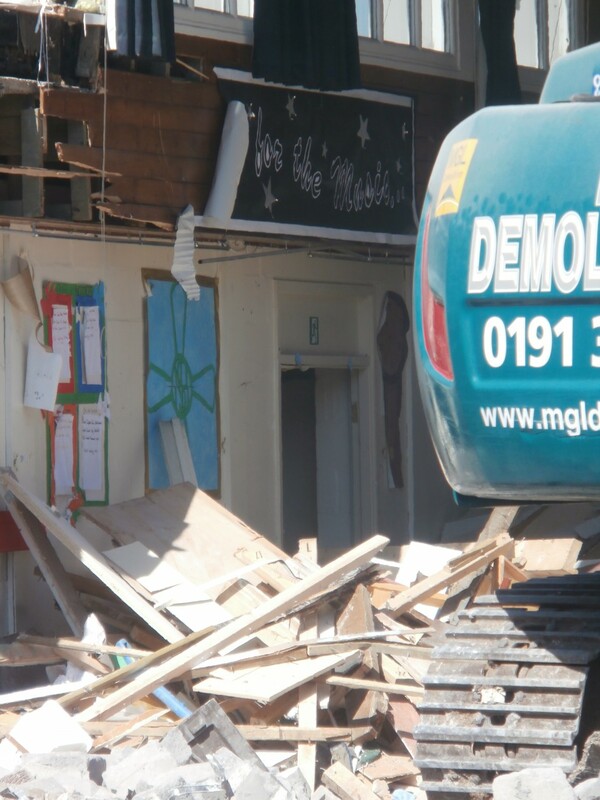 Day 3 of the Junior School demolition: the Junior Hall in the process of being dismantled. Mark from Tolent kindly allowed me access to the site so that I could record the process up-close and it was very moving to see artwork depicting the Church High School Badge still in place on the wall. 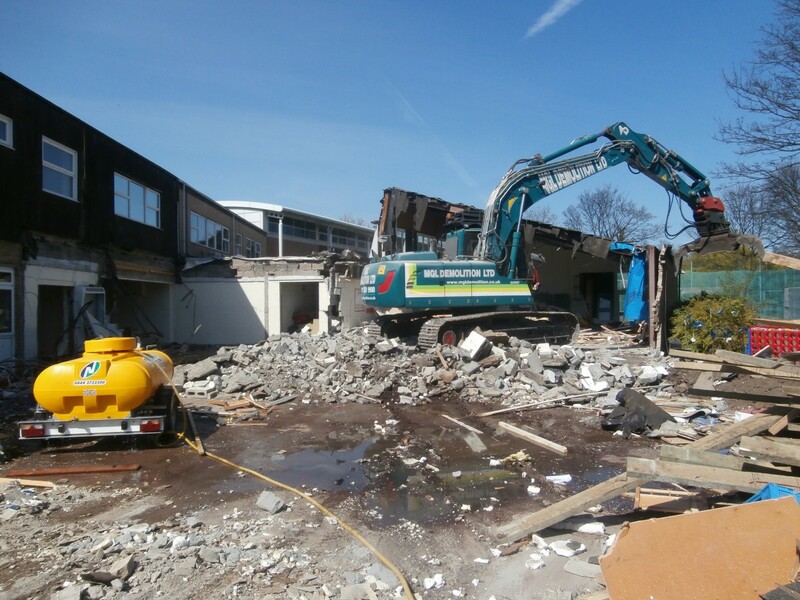 The final stage of the demolition, the main classroom areas and the newest Science Wing had been completed by the end of the week. 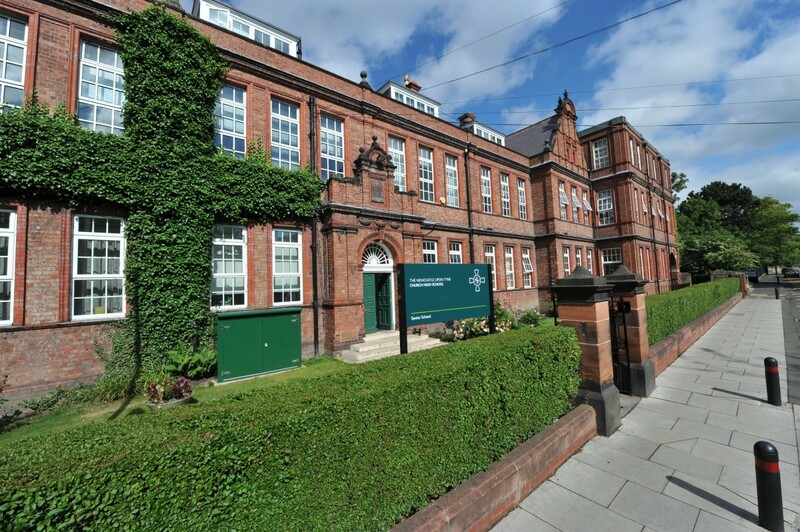 Although there was an administrative presence on site until Thursday 10th when the answerphone was switched over to Eskdale Terrace, on Friday July 4th at approximately 1.30 pm the very last girls in green uniform left the Church High building for St George’s Church, Jesmond, to celebrate the End of Year Service. This last emotional service began with the traditional procession lead by the Head Girl carrying the cross. 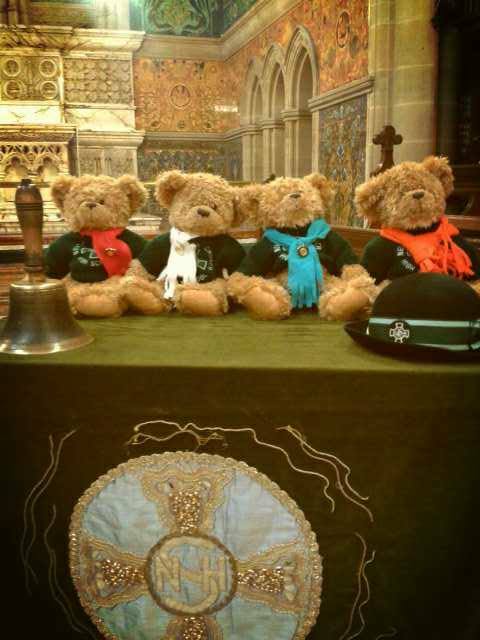 Behind her on this special occasion, however, were younger girls carrying the four House Bears, an old school hat and the school bell; all were laid on the altar. 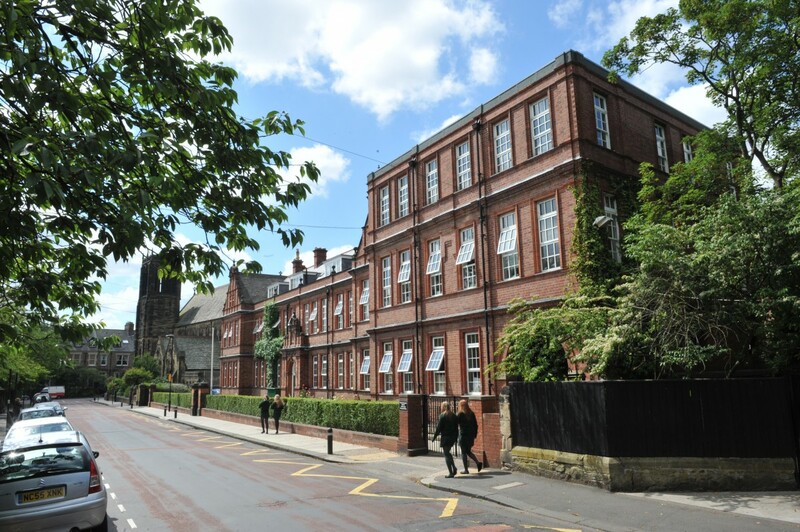 ‘Newcastle upon Tyne Church High School (also known locally as “Church High”) was an independent day school for girls in Jesmond, less than a mile north of the city of Newcastle upon Tyne, England. Until 2014 it was the oldest continuously operating girls’ school established in the city. “Church High”, as the school is commonly known, was founded in 1885 by the Church Schools Company (now known as the United Church Schools’ Trust). It left the company in the 1920 and has been independent since, but retained ties with the Diocese of Newcastle and St Nicholas’ Cathedral. 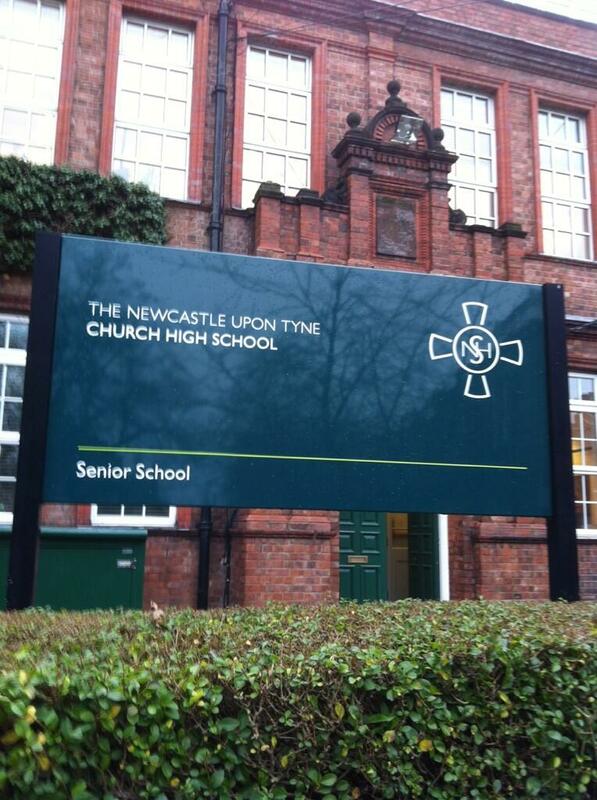 Church High was one of the North East’s top performing independent schools in GCSEs and A Levels. In the 2010 GCSE league table, it was ranked joint third with Central Newcastle High School out of 100 schools in the North East. 98% of its candidates scored 5 or more A*-C grades that year. Church High’s Tankerville Terrace site was chosen as the home of the Newcastle High School for Girls Senior School and Central High’s Chapman House as the home of the new Junior School. However, in order to accommodate an enlarged and extended Senior School of 700 girls on the Tankerville site, Church High’s Junior & Infant School built in 1975 was earmarked for demolition. 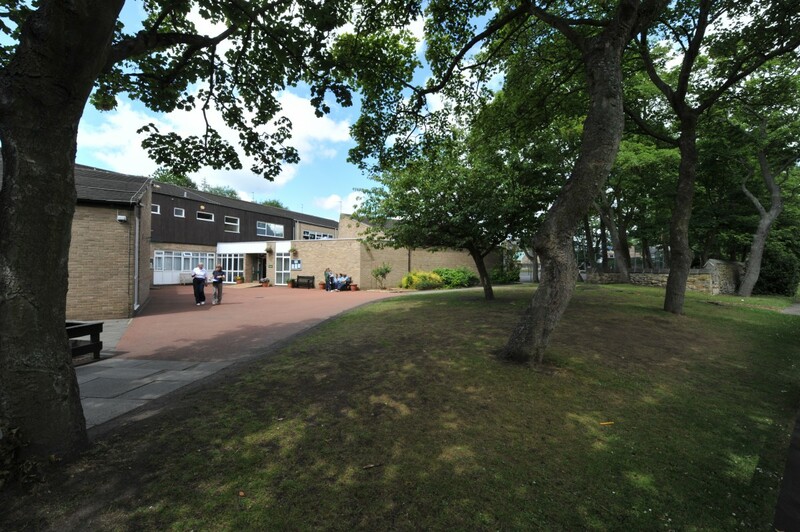 Whilst planning permission for the new-build was sought and the building and renovation works carried out, Church High girls and staff going forward to the new school moved into Central High’s Eskdale Terrace building in September 2014 for the first two years of the Newcastle High School for Girls. 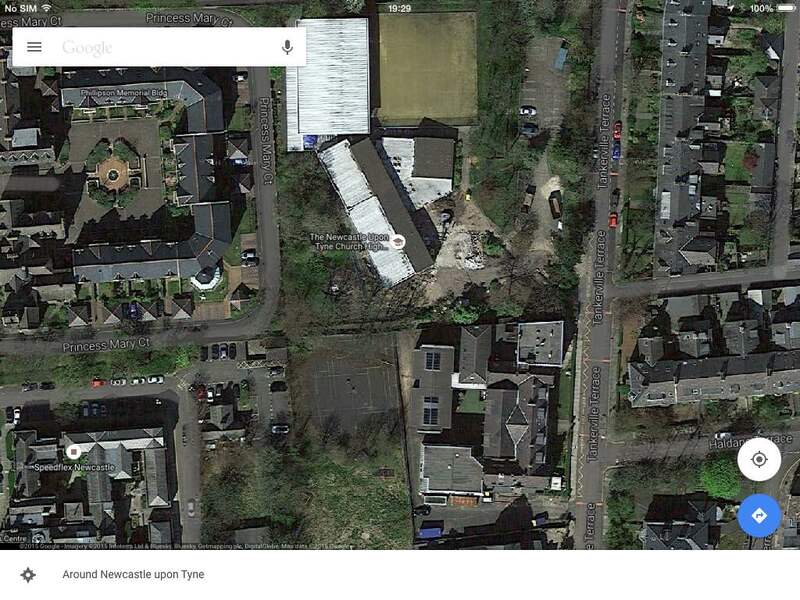 Newcastle upon Tyne Church High Senior and Junior School buildings as we remember them on Tankerville Terrace.